We take great pride in our regional advertising showing southeastern North Carolina examples of what we do. We’d like to feature your home in a future ad. It all starts with a call! 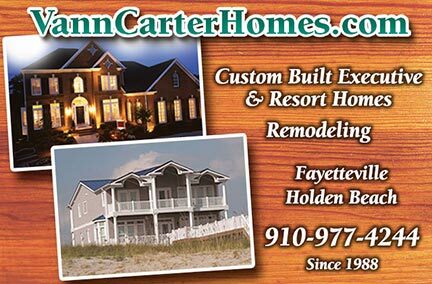 First and foremost is our “Vann Carter Signature Home”. Virtually all of our resort and executive homes fall into this category and are our specialty. Each home is 100% handled by Vann Carter personally from start to finish, the conception of the plan to the delivery of the key, on a day to day basis in the field, with no foremen, etc. Only a very select few homes are scheduled into this program to ensure the one on one attention our client/partner deserves. Each home is unique with specialized craftsmen and materials demanded by the most discerning homeowners. Definitely not for everyone. “Very rare, very well done”. For those client/partners building a custom or semi-custom dream home who want the highest quality and value for their dollar available, we offer the “Vann Carter Custom Home”. You will work with one of our professional construction specialists from start to finish, choosing the materials and services that best fit your budget. You may call Vann at anytime with your questions. In keeping with our primary focus, we develop and offer single family residential lots for sale to our clients. Please click on our Featured Properties for availability. Vann Dean Construction, LLC, a full service Unlimited Licensed NC General Building Contractor, is the combined 50+ years industry related experience of partners Vann Carter and Dean Downing. We offer trusted and proven solutions to the contracting needs of commercial, professional and investor clients, ranging from new construction and design/build to upfit/renovation and consulting. These same services are available to our residential customers, who may have historically had to rely on “fly by night” or unlicensed home improvement companies. Your imagination is our only limitation on how we can transform your home. In addition, we offer emergency, natural disaster, fire, water and mold remediation services coupled with expert insurance negotiating and claim services for our clients. Should you have an emergency need or just want to discuss your project ideas, please feel free to contact us personally on the cell phone numbers below.